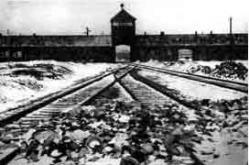 A day tour to the infamous Auschwitz Concentration camp from Prague. As much as we would like to discourage you from doing this tour in one day, some people just don't have the time. So, this one day tour is offered. The drive alone is approximately 6 hours each way (12 hours driving altogether) - traffic permitting. The departure from Prague is very early, about 5:00 am, and this gets you to Auschwitz at approximately at 12:00 noon. Visit the camps, which will take about 4 hours and then return to Prague. This gets you back into Prague at around midnight. The site is open every day, all year long. You must either join a group tour or take a private guide to take you through the camp. Walking alone is no longer permitted. For both a reservation and prepayment is necessary. We will be happy to make the reservation for you as part of the tour. The camp is very popular and books up early - easily months in advance. Please plan ahead. Reserve as soon as you know your schedule. A guide from Prague is not mandatory and may not be necessary. We will assign a driver that has at least some English, however, English knowledge of the drivers is far from perfect. Should you prefer a more professional tour, please take a guide as well. Our guides English is very good and you will be given a narration along the way on the Czech Republic, the major cities you go through as well as parts of Poland. Once there, the camps guide, wheather your own - private - or for the whole group - will take over. You will receive headphones to clearly hear your guide. The price differs and changes often - beyond our control. Please inquire directly - praguepg@aol.com. In general, joining a group will cost about EUR 15 per person. A camp guide for your private tour is about EUR 100 for the group. The tour lasts about 3.5 hours. 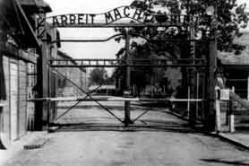 Over the following years, the camp was expanded and consisted of three main parts: Auschwitz I, Auschwitz II-Birkenau, and Auschwitz III-Monowitz. It also had over 40 sub-camps. At first, Poles were imprisoned and died in the camp. Afterwards, Soviet prisoners of war, Gypsies, and prisoners of other nationalities were also incarcerated there. Beginning in 1942, the camp became the site of the greatest mass murder in the history of humanity, which was committed against the European Jews as part of Hitler's plan for the complete destruction of that people. The majority of the Jewish men, women and children deported to Auschwitz were sent to their deaths in the Birkenau gas chambers immediately after arrival. At the end of the war, in an effort to remove the traces of the crimes they had committed, the SS began dismantling and razing the gas chambers, crematoria, and other buildings, as well as burning documents. Prisoners capable of marching were evacuated into the depths of the Reich. Those who remained behind in the camp were liberated by Red Army soldiers on January 27, 1945. A July 2, 1947 act of the Polish parliament established the Auschwitz-Birkenau State Museum on the grounds of the two extant parts of the camp, Auschwitz I and Auschwitz II-Birkenau. Distance from Prague to Osvietim (Auschwitz) is approx. 485 km/300 miles each way - driving time is 10-12 hours round trip, traffic permitting. Time spent at the camp is about 4 hours.